My least favorite part of the year. I know everyone's got this idea up in their little heads that hell is burning hot. Our culture describes hell with fire and melting and endless heat. When you google "hell", this is the picture that comes up. 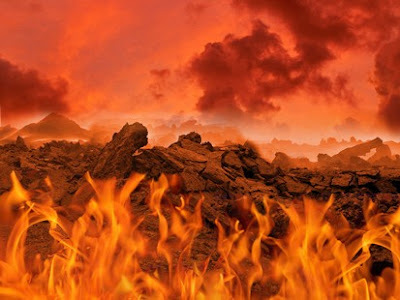 But as far as I'm concerned, everyone's got it all wrong with their images of a burning hell. I think hell is cold. Dark ugly and cold. In my mind hell is disgustingly similar to the three months that we are currently embarking upon. January. February. March. I think hell is short days, and dark, cold rides to school in the morning. I think it is scraping ice off the car windshield, and unlimited shades of brown and yellow scenery. I think hell is wind, and dirty snow, and no holidays and week after week of school without a day off. Yes, it is my hell. And I am staring it down the throat. It doesn't help that today is my first day back to work after our meager Christmas break. My first day back was supposed to be yesterday, but I just couldn't live with a six day winter vacation. I needed more time or else I would surely end up behind bars for manslaughter of a minor. Or many minors. And yes, that crime exists, ask my friend, Sally, or my brother, Travis. They're lawyers and they know the law like the back of their hand! Oh, wow, we got lost there, didn't we? What I'm trying to say is that I absolutely NEEDED that extra day off of work and Hubs and I lived it up, sleeping in, getting lunch at Cafe Rio, and treating ourselves to hour long massages. And the whole times my students were in school, laboring over the school work I had left them. Suckers. So, yes, I successfully delayed my return to school by one day, but I couldn't delay it forever, so I crawled out of bed at 5:55 this morning, climbed into my cold car in the dark winter's morning, and was back to school by 7:00 am sharp. Okay fine. 7:10 am sharp. Do you want to know what I thought of as I drove? Yep. How much I hate January. February. And March. I've got the January blues. The Jan-jan-january blues. Can someone please transport me to April? PLEASE? I think sometimes God knows that I've got the January blues, that I'm sad about waking up early, about my long drive, about the end of Christmas break. And when He realizes I've got the blues, He sends me something to cheer me up. Do you want to know what He sent today? 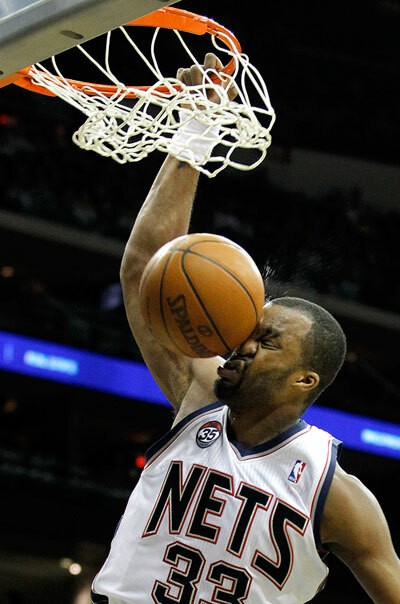 Shelden Williams hit himself in the nose while dunking the basketball in a game last night. It doesn't get much better than that, people. And that's why we should all be grateful 1. That the NBA Lockout is over and 2. That people like this exist. What else could combat the January blues in such a stellar fashion?